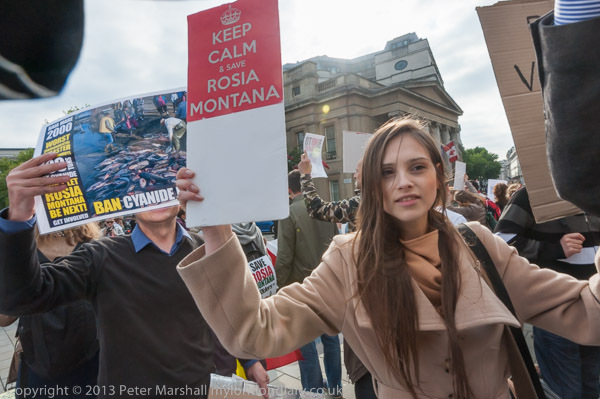 Romanians protested in Trafalgar Square against their government's plans to allow a Canadian gold mining company to destroy the heritage site of Rosia Montana and threaten massive cyanide pollution of the Danube and Black Sea. The London protests were part of international support in countries around the world for the regular protests that have been filling the streets of Bucharest, Cluj-Napoca and dozens of other cities in Romania, particularly since September 1st, although the campaign against mining Rosia Montana has been active for 15 years. The largest protests there are on Sundays, with over 20,000 people last week in Bucharest. The state gold mining company in the area closed in 2006, shortly before Romania joined the EU. The proposals for a new mine come from the Rosa Montana Gold Corporation (RMGC), 80% owned by the Canadian company Gabriel Resources and just under 20% by the Romanian state. The protest took place in the corner of Trafalgar Square overlooking Canada House, with its row of Canadian flags. The Canadian Government have given the mining of Rosia Montana their support since 2005. Romania in 2000 saw what has been described as Europe's worst industrial disaster since Chernobyl, when cyanide from a gold mining company's operations leaked into a river near Baia Mare. The incident involve several times smaller pond with an estimated 100 tons of cyanide, and contaminated drinking water for over 2.5 million Hungarians, wiping out wild life on a large stretch of Hungary's second largest river, the Tisza. In Romania the government had to have temporary bans on fishing and drinking of water from the Danube despite the dilution in the large river. Two years later the area had begun to recover, but fishery levels on the Tisza were still only around a fifth of that before the spill. This year the Social Liberal Union government led by Victor Ponta, leader of the Social Democratic Party announced that it would pass a new law which would allow mining at Rosia Montana, bypassing the environmental and heritage regulations that have previously prevented it, provoking the current protests. The controversy over mining is just one of a number of areas of disatisfaction of many with the government and politics generally in Romania. Some of the protesters have named the protests the 'Romanian Autumn'. Around a hundred people came for the protest, which followed a slightly unusual course. After standing behind banners, holding placards and shouting slogans for a little over an hour, the protesters sat on the pavement in front of the National Gallery for a violin recital, which was still proceeding as I left. 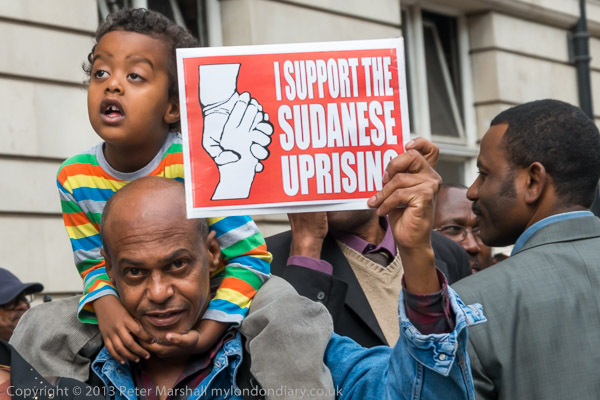 Sudanese called for Omar al-Bashir and the National Congress Party to to go in a protest at the London embassy after six days of protest in Khartoum over rises in fuel prices and corruption which have been brutally attacked. The protest was by members of 'Sudan Change Now' and the 'National Sudanese Women Alliance'. They complain that the government disrespects the Sudanese people and ignores their education and health, with all the money going into 'security' spending, which does not make the people secure. They state that the best men and women there are paying for their lives in brutal wars in South Kordofan, Blue Nile and Darfur, provoked by the regime. They blame the government for educated youths being unable to find jobs in the Sudan and for the suppression of freedom there. The see the government as a total failure in managing the country for over 23 years, presiding over a total collapse in political, economic and social terms, and that the Sudanese people have a collective repsonsibility to put an end to it and get a better furtre for their nation, and to replace it by a civil, democratic and plural system which protects basic freedoms and ensures a fair and balanced sharing of the national wealth. Some see the current protests in Sudan as the start of a mass popular revolution there like those in the Arab spring. The protest was scheduled to last another hour when I left, and more people were still arriving to swell the crowd of a hundred or so in a pen close the the Sudanese embassy. 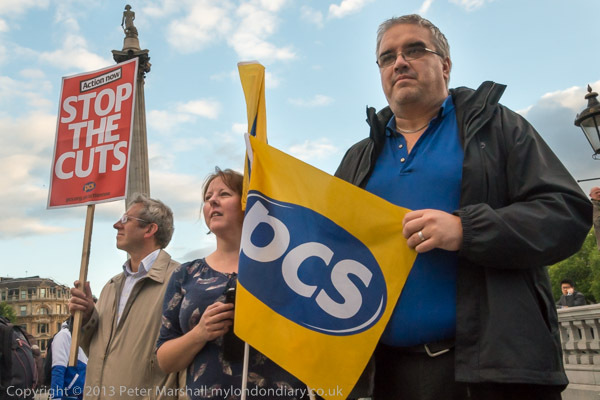 Disabled activists and supporters came to Parliament Square for '10,000 Cuts & Counting', a ceremony of remembrance and solidarity for over 10,000 who died shortly after the degrading Work Capability Assessments run for the government by Atos. The ceremony, in the square bounded by the Houses of Parliament, Westminster Abbey, the Supreme Court and the Treasury was organised by the 10,000 Cuts & Counting Campaign including disability activists, Occupy activists and the Dean of St Paul's Cathedral for those who have had their lives devastated by the austerity programme. 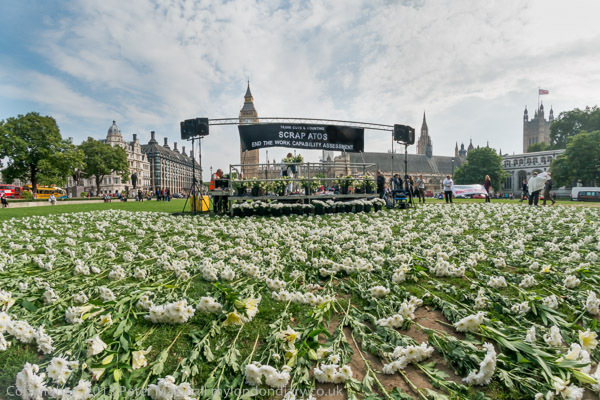 A large area of Parliament Square was covered by white flowers to represent the 10,000 who have died in the 3 months following the degrading Atos-adminstered tests used by the government intended to assess the needs of people receiving benefits related to disability and ill health. The campaigners are not claiming that the test killed that mnany, although some have been driven to commit suicide after being failed by Atos, but that such tests adminstered in the final days of life are unfeeling, unnecessary and persecute the sick and dying. The event included a number of moving testimonies by disabled people and a mother of three disabled children, and these including many damning indictments of the failures of Atos and the Department of Work and Pensions, with a failure to understand the needs of the disabled or to treat them with dignity and humanity, of deliberately discriminatory policies, arbitrary decisions and bureaucratic incompetence. The government appears to have taken a highly cynical approach, mistakenly seeing the disabled as and easy touch for cuts, thinking they would be unable to defend themselves. But nothing has proved further from the truth, with disabled activists at the vanguard of protests against benefit cuts and in particular the bedroom tax. These have put a totally unfair burden on disabled people, and they have responded with fury and some purpose. Many of those who spoke or sat listening in wheelchairs were those who I have got to know blocking roads, picketing Atos, occupying the DWP and more. As well as the many testimonies, there was a 2 minutes of silent remembrance for those who have suffered and died and then four prayers facing the four sides of the square: towards Westminster Abbey for the families of those who have suffered and disabled people still suffereing or despairing; facing the Supreme Court calling for justice and compassion for those without resources and power and for an end to discrimination and violence against the disabled; towards the Treasury calling on those in national and local government who decide on the use of resources to take into account the effect on people of what they do; and finally towards Parliament, calling for a new deal for disabled people and to put right the evident wrongs in the current system. The event was led by David Ison, Dean of St Paul's Cathedral, together with well-known Sunni Muslim Mohammed Ansar. Michael Meacher MP made a powerful speech, and when I left both John McDonnell MP and Jeremy Corbyn MP were waiting to speak, along with a number of disabled activists. A protest outside the offices of Northern & Shell, Richard Desmond's group which publishes the Express and Star newspapers, OK! and other magazines, told the group to stop attacking migrants and start paying the tax it hides offshore. Britain relies on the labour of around 4 million non-British workers who make their contribution to our tax and national insurance, but are subjected to repeated attacks, often based on invented or unattributed gossip about their supposed 'sponging' off the British state. 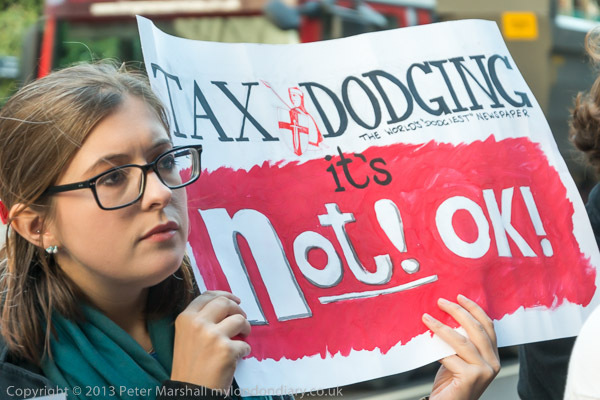 Unlike them, Northern & Shell uses holdings in the Channel Islands and other tax havens to avoid paying its dues to the British economy, paying very little UK tax. The event started with a bang, though only a small one, as a small dog jumped up to burst a red balloon held for the purpose by Thomas, which amused the fifty or so watching, but most of the protest was rather more serious. One speaker talked about the Health Lottery which is run by N&S, and is controversial because only 20.3% of the ticket sales goes to the good causes - significantly less than the 28% from the National Lottery. Rather more -22% - goes into N&S for the operating costs, marketing administration and contibutes to the group's profits. The protest also dealt with the wider issue of the government's attitude to migrants, with Christine Gilmore from Leeds giving an account of both her problems with our now highly politicised immigration system, with the UK Borders Agency putting difficulty after difficulty in the way of her bringing her husband from Syria, where his life is in danger to this country. The UKBA refused to accept his certificate of distinction in English, refused to accept bank statements as evidence of her savings and income . Still in Syria, her husband narrowly avoided being killed by a sniper at the end of August. The problems they are facing are not a matter of a few racist employees at the UMBA, but racist policy and directions to staff from the Home Secretary. I've photographed Mark Thomas at numerous protests over the years, including some he has organised and many others, giving his time and talents to various causes. He has made a pledge to carry out '100 Acts of Minor Dissent' in a year, taking part in and encouraging political activity by others, and if he fails to donate a thousand pounds to UKIP - the worst cause he could think of. He brings a little extra twist of humour to protesting, as in the placard one protester had brought, with a picture of Princess Diana and the message 'Let's be honest, Princess Diana would have Hated Tax Dodging', which was, as he said, almost certainly not true given her assocation with the Al-Fayed family, but a homage to the Express newspapers, who never let the facts get in the way of a good story. Women of Hizb ut-Tahrir appalled by the chemical attack and other massacres of women and children in Syria marched in London to show solidarity and called for Muslim armies to mobilise to defend the blood of their Ummah. More than a thousand women gathered at Paddington Green for a short rally before marching to the Syrian embassy. At the front of the march children carried a small coffin and others carried bundles representing dead children. As they say in the call for the march "rows upon rows of dead children in their burial shrounds have no doubt brought us to tears as Muslim women, for this is our beloved Ummah that is being killed." The leafelt called on them to "Stand in solidarity with your sisters in Syria and speak out against the shedding of their blood and that of their familes and children." They reject the idea of Western military intervention in Syria, which they say "will only subject its Muslims to another phase of oppression as seen in Afghanistan, Iraq and Libya and is aimed at preventing the establishment of Islamic governance in Syria." Hizb ut-Tahrir seek the replacement of the current corrupt rulers in Islamic states by a Khilifah (caliphate), a state that will truly implement Islamic values and end the corruption and oppression of the current states. They want Muslims to rise up and get rid of corruption, and in particular of "the criminal regime of the butcher Bashar Al Assad" in Syria, for "Muslim armies to mobilise and replace the rule of the dictator with the rule of Allah." Almost all the women on the march wore headscarfs, with only a very small minority in niqabs or burqas which covered the whole face. Very few turned away when I raised my camera and I had no problems photograping the march setting up and a rally before the start at Paddington Green. There was one small group of men with a banner and a heavy public address system, but otherwise the whole protest was by women and children. I left the march on Edgware Road on its way to protest at the Syrian embassy. 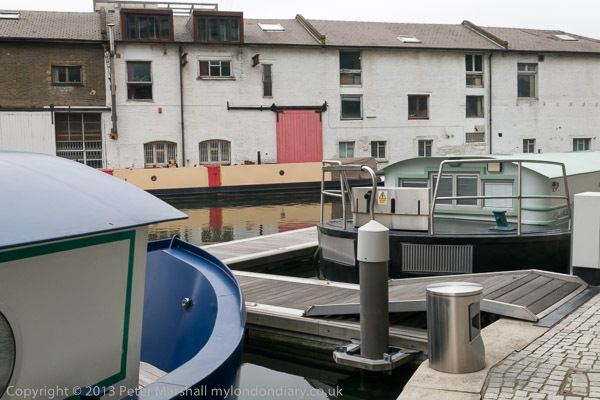 I took a walk around Paddington Basin, one of the larger areas of recent redevelopment in central London, and took a few pictures. A few of the older canalside buildings remain, surrounded by new development on a much larger scale. Much of the land and the pathways, although open to the public are on private property, and some photographers have been challenged by security while working in the area, but I had no problems. As well as some single images I also made three panoramas. 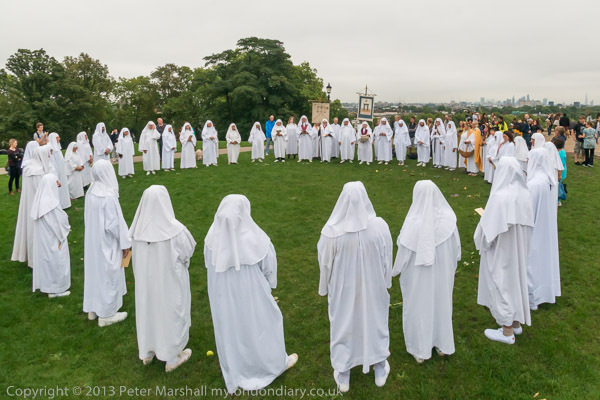 The Druid Order celebrated the Autumn Equinox (Alban Elued) with a ceremony on top of Primrose Hill in London at 1pm in their traditional robes. They have been organising similar celebrations for just over a 100 years. After processing up the hill to form a circle, a long horn was sounded to the four corners of the world and then the sword was held aloft to each in and pulled loose with the call "Is it Peace?" and on receiving the reply "Peace", pushed back. The lady, representing the Earth Goddess Ceridwen then requested permission to enter the circle with her two attendants, and it was granted. They brought a horn containing cider and a basket of fruit and flowers, the harvest of the earth to the chief druid. The cider was tasted, then carried around the circle with libations being poured onto the earth. He also received the basket of fruit and flowers and this too was emptied out as he walked around in the circle. The names of companions of the ancient order no longer with us were read out, including that of the artist William Blake and other well-known historical figures. We all observed a minute or two of silence and their was a fairly long address, a message of peace and human understanding. The Druid Order are peace loving and free-thinking and their main aim appears to be to develop themselves through being rather than through intellectual learning. Near to the close of the event, the druids joined hands around the circle and renewed their druid vows. In a final act of the ceremony, four druids came to the centre of the circle and raised the hands in turn to proclaim peace. Everyone present was thanked for coming and an invitation issued to those who want to find out more about the order to attend their regular public meetings. The druids then left the circle in order through a gate made by two of their number and processed away down the hill, again forming a circle briefly before beginning to disrobe. Another smaller group of Druids were also at Primrose Hill, but rather than celebrating in public on the open hill-top, they performed their rites almost hidden in a small grove of hawthorn trees a short distance to the west. For a short time they came over and watched the ceremony by the Druid Order. The Druid Order was formed, along with a mythic history linking it back to earlier times, around a hundred years ago by the remarkable George Watson MacGregor Reid, who was also a trade union and Labour party activist and had a great interest in oriental mysticism. The 'history' links it back to a call by John Toland on Primrose Hill at the Autumn Equinox of 1716 for a meeting of Druids at the Apple Tree Tavern in Covent Garden a year and a day later. According to the Fifth Mount Haemus lecture by Dr Adam Stout in 2005, their first recorded appearance appears to have been at the Summer Solstice at Stonehenge in 1912, although Macgregor Reid may have been there in 1909. A photograph from 1912 shows him striding through the stones in Indian dress leasing his "Universalists." The following year he was back, describing himself as a High Priest and "the direct successor of the Chief Druids who have been" and dressed in a very similar manner to that still adopted by The Druid Order. Primrose Hill occupies an important place in the history of the re-invention of a Druidic tradition. As well as the call said to have been made by Toland in 1716, it was here on Midsummer's day 1792 that Iolo Morganwg (1747-1826) held the first meeting of the Gorsedd of the Bards of the Isle of Britain, the precursor of the modern Eisteddfod. Morganwg added his druidic inventions to his translations of ancient Welsh manuscripts, inventing much of Druidic myth and symbols such as the the 'Awen' symbol with its three 'rays' which is worn by the leading druids of the Druid Order. Young professionals from Junior Chamber of Commerce for London or JCI (Junior Chamber International) celebrated the UN's World Peace Day, promoted by Peace One Day in Trafalgar Square by dancing to a band in blue hats with lightbulbs, some of the Pandemonium Drummers, volunteers who took part in the Olympic Opening Ceremony as the 1000 drummers in the Industrial Revolution scene, as well as acting as marshals for the athletes parade and the closing ceremony. 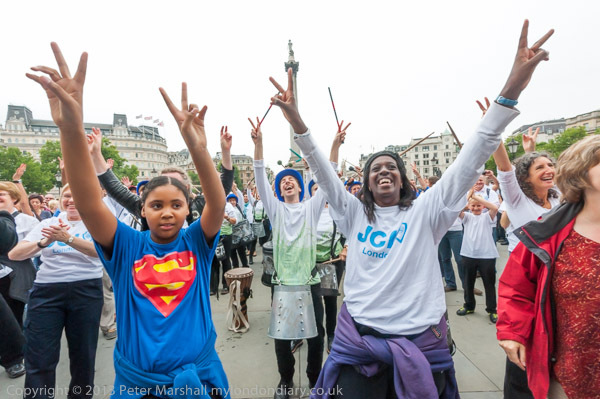 JCI Junior Chamber International, also known as Junior Chamber of Commerce for London describes itself as a 'global network for young people in their 20s and 30s' which runs "many inspiring events and projects with our members." One of the annual events it supports is World Peace Day, and as a part of a Peace Day Conference and Dance it got the members to take part in what it called a Peace Dance Flashmob, though it did not appear to be in any sense a flashmob. It was more of a staged performance, taking over the pitch below the stairs up to the National Gallery entrance in Trafalgar Square at 4pm, although those taking part - a street band dressed in Olympic ceremony style blue hats with lightbults on them and a group of mainly young people in JCI t-shirts - had arrived half an hour beforehand, and some had been handing out postcards about Peace One Day. From the cards I found that that Peace One Day was an organisation founded by film-maker Jeremy Gilley in 1999 that campaigned successfully for the UN's World Peace Day to be fixed as September 21 (previously the third Tuesday of September had been the International Day of Peace, but few people noticed it.) Since that aim was acheived in 2001, Peace One Day has been raising the profile of the day by organising events, contacting world leaders and asking them to observe it and sine 2006, and getting people to carry out projects. One example has been the organising of polio vaccination for 4.5 million childerne in Afghanistan. 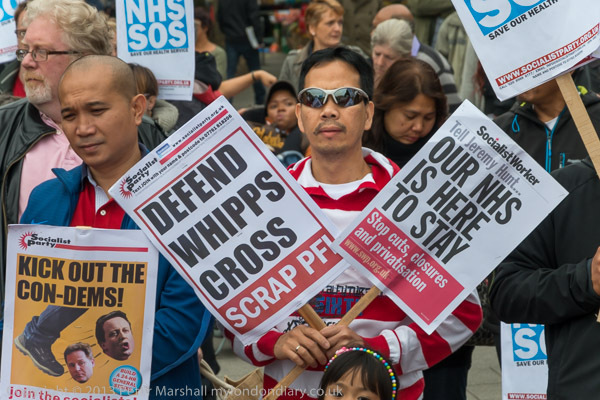 Hundreds marched from Whipps Cross Hospital through Leyton to a rally in Walthamstow calling for an end to mismanagement and cuts by the Barts Hospital Trust and the cancellation of PFI debts which are crippling the NHS. Until recently Whipps Cross University Hospital (WXH) was a highly successful and financially viable hospital deserving its good reputation in the large area of north-east London it serves. Among the many who have been born there was footballer David Beckham. In 2007-8 a well supported local campaign was succesful against closure, but the hospital is now under threat again, not because of any financial or clinical problems at WXH, but because of the massive debts of another London hospital. WXH is now a part of Barts Health Trust, along with Barts, Newham, The Royal London, Mile End and the London Chest Hospitals. The trust as a whole is losing £2m a week and has already made cuts which have worsened services at WXH and other hospitals in the group, but they need to make further cuts, totally £77.5m per year, and these will fall heavily on WXH. Cuts already made have resulted in the Care Quality Commission finding systemic failings in elderly care and maternity services at Whipps Cross, failing to meet 10 of the 16 national standards for quality and safety, and receiving three formal warnings. Campaigners to save the hospital see the lowering of standards by the Trust as designed to make closure easier. The £2 million a week loss isn't because the hospitals are inefficient or badly run, but is actually more or less equal to the interest and repayments the Trust has to pay to bankers who financed the PFI (Private Finance Initiative - or as protesters call it, Private Fraud Initiative) of £115m a year (£2,21m per week.) This repayment does nothing for the health of the London public, but gives rich rewards to the bankers, who, according the the campaigners have already been repaid five times over. The fight against these and other PFI repaymnents is a crucial one for the future of the NHS. PFIs were a Conservative idea taken up with great gusto but almost zero business nous by New Labour, trading short-term political advantage (in this case a shiny new replacement hospital for the ancient Royal London in Whitechapel) for long-term economic disasater, apparently in the hope that 'something would come up' or that we would enjoy a period of huge expansion and inflation. What came up was the financial crisis and depression, and the result if no action is taken will be to require the sacrifice of the NHS as we know it. The campaigners call for a cancellation of PFI debt, and certainly a very stiff haircut would seem to be both appropriate and necessary. Almost five hundred turned up for the start of the march at Whipps Cross, many of them workers at the hospital, and there were several short speeches, including one from a UCL worker and campaigner Janet Maiden, and a message of support from RMT General Secreaty Bob Crow was read out. There were many signs of support from shopkeepers, people on the street and drivers as the march made its way to Town Square in Walthamstow for a final rally. Speeches at Walthamstow included a fiery performance from Fire Brigade Union General Secretary Matt Wrack , and there were loud cheers for several WXH nion reps, particularly Charlotte Monro, chairperson for Unison’s Waltham Forest health branch at the Leytonstone hospital, who was banned in July from representing members and threatened with disciplinary action. But the largest welcome of all was for nurses rep Rod Villaggio. Protesters who care about arts and culture formed a human chain outisde the National Gallery in a protest against cuts in spending, 'Dont Go Breaking My Arts', against cuts in art funding. The protest, organised by the PCS was supported by the Musicians Union, BECTU, Unite the Union, NUJ, Equity, Prospect and the Writers Guild. The protesters poing out that the arts budget of the Dept of Culture, Media and Sport has been cut by a third since 2010, leading to closures and staff losses and reducing public access to many cultural bodies and events. At a local level, the cuts in art funding by the Dept for Communities and Locval Government in 2013/4 of £124 million have also had a serious impact. These cuts are short-sighted in financial terms, since, as one placard pointed out, 'Every £1 invested in arts and culture generated £6 for the economy'. And the arts are a major earner from tourists, bringing in £865 million every year. The cost of arts and culture spending amount to only 14p per person per week, and provide a great deal of well-being and satisfaction to a wide range of the public - over 78% of adults attended or participate in the arts last year. The creative industries are also a major source of employment, providing 2.5 million jobs, and are a powerful force in the regeneration of the run-down areas of our cities. The protesters linked hands to form a human chain along the frontage of the National Gallery, and then formed this into a circle to listen to a number of speakers. They called on the government to protect funding for the arts and culture, which are vital to our civilisation and are not a luxury but a human right. 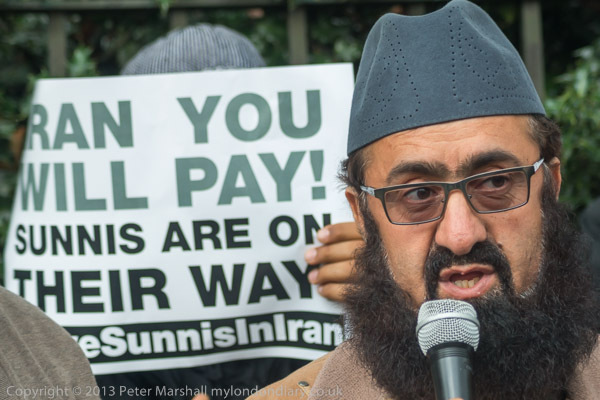 Around 50 Sunni Muslims, including Anjem Choudary, protested at the Iranian Embassy in London calling for the release of 26 Sunni Muslims currently on death row in Iran, four due to be hanged on Saturday. The Iranian regime is a Shia Muslim state, with around 5-9% (estimates vary) of the population being Sunni Muslims and around 2% following other religions. Members of minority religious groups who actively promote their faith may be charged with the offence of 'Moharebeh', waging war against God, although this is usually only used for those who take up arms against the state or working with a group that does so. The penalty for Moharebeh is death. Currently 26 Sunni Muslims are on death row in Iran, according to the protesters for simply speaking up for their faith. They are said to have been tortured into making confessions, and human rights organisations have confirmed their shocking treatment. Ten Sunni prisoners were tried in Novermber 2012, appearing in court blindfold, handcuffed and shackled; the trial lasted 10 minutes. Six of them were executed in December 2012 and four, Jamshed Dehghani, Jahangir Dehghani, Hamed Ahmadi and Kamal Malaie are to be hanged this Saturday. Jamshed and Jahangir Dehghani are alleged to have been arrested for distributing books and leaflets about Sunni Islam. There were a number of speakers including Anjem Choudary, one of the founders of the banned group Al-Muhajiroun and other banned organisations. The posters called for the release of the 26 Muslims, and a number of them were shown on individual placards with the message 'Don't Execute' and their name. Other placards called for an end to Shia Crimes against Sunnis, and pointed out that Iran was a terrorist state which supports Syria and its dictator, Bashar Al-Assad. More disturbing was one which stated 'Iran you will pay - Sunnis are on their way' though the threat was perhaps an empty one. A few yards along from the main group of male protesters and speakers a small group of women, mainly fully covered except for their eyes in black burkhas was also taking part in the protest, holding up posters. The protest appears to have been organised by the Muslim Prisoners website, on which the Press release appears. This was set up by convicted terrorist and former member of the banned group al-Muhajiroun Abdul Muhid. Much of the inflammatory and possibly illegal material for which the site has been widely criticised appears to have been removed, but among the prisoners supported by and still listed on the site are Salahuddin Amin, convicted for plotting a bomb attack on the Bluewater Shopping Centre, Ahmed Ali who plotted suicide bomb attacks on ariliners, BA worker Rajib Karim who tried to get a bomb on a plane, failed Underground suicide bomber Hussain Osman, Roshonara Choudhury who attempted to stab MP Stephen Timms, Bilal Ahmad who exhorted Muslims to murder MPs who backed the Iran war and others in UK jails. Aurora, a polar bear the size of a double-decker bus attracted several thousand supporters, many wearing bear masks to join her on a walk to tell Shell to stop drilling in the ecologically fragile Arctic, which would result in global catastrophe. Aurora is a giant three ton people-powered puppet with a crew of 15 puppiteers and pulled by teams on ropes. As well as various movements which give a pretty realistic impression of a crawling bear, with a mouth that opens dangerously wide, also has a frighteningly powerful roar. High winds and the threat of stormy rain meant that her proposed route across Lambeth Bridge, past Parliament and back across Westminster Bridge had to be abandoned for a more direct rout along the South bank, past St Thomas's Hospital. She made her way slowly and with frequent stops from a yard in Lambeth to the Shell Centre at Waterloo, where the large crowd heard a short address from Greenpeace and a longer message including a spirit song from two Canadian first nation activists. They made clear their opposition to any development such as oil drilling that would risk the land they have in trust. At the end of the protest, those present were invited to take part in a small act of civil disobedinece. Shell apparently have an injection against Green peace which prohibits them from entering their premises, and from goin inside a line just outside them. We were invited to break that injunction by going on to the pavement directly outside the building and showing our presence there by chalking around our feet and perhaps leaving a chalked message; those who wished to stay within the law could instead chalk on the roadway. Many of those present did both, and soon the pavement, raod and defensive block and plant containers on the side of the pavement were covered with chalkmarks. Police stopped a few people from chalking on the marble walls of the building, but as they moved to stop some, others were writing unchecked. 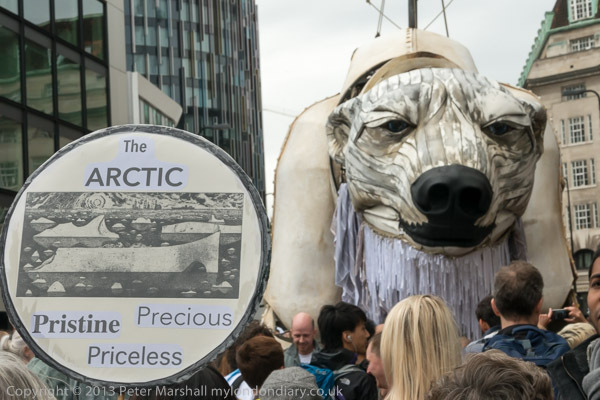 Aurora's parade in London was a part of a global day of action, #Iceride, with protests by people in over 110 cities around the world against Arctic destruction. 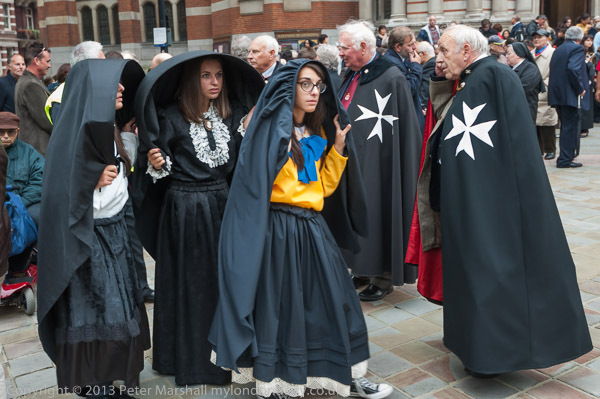 Malta Day celebrations in London included a Mass at Westminster Cathedral attended by the Lord Mayor of Westminster, Cllr Sarah Richardson, followed by fireworks and a street procession including the Statue of the Bambina led by brass band. September 8 is a public holiday in Malta, celebrated as the Feast of Our Lady Of Victories or Victory Day. Celebrations in several villages in Malta mark the Nativity of the Blessed Virgin Mary, commemorated in the statue of 'il-Bambina' which was carried in the procession. It is popular as the last in an annual season of festivals in Malta. It also celebrates the Victory of the Knights of St John of Malta against the Turks in 1565, a victory over the French in 1800 and the surrender of Italy, then occupying Malta, in 1943. The celebrations organised by the Maltese Culture Movement, promoters and organisers of cultural events for the Maltese community in the UK were held around Westminster Cathedral on the Saturday after Victory Day and included a Maltese Fair which was followed by a Concelebrated Mass in the Cathedral and the procession to the Sacred Heart Chapel of Ease in Horseferry Road. In the evening there was a Gala Dinner and Dance in Mayfair. There are 26 Bishops in the House of Lords. But around 900 others who shouldn't be there too. Around a hundred people attended the 6th annual Secular Europe Campaign protest today, marching from Temple to a rally opposite Downing St, celebrating secularism and demaning an end to religious discrimination and indoctrination. The movement was also holding a related protest in Krakow. I'd arrived too late for the London march, and the rally was well under way when I arrived. 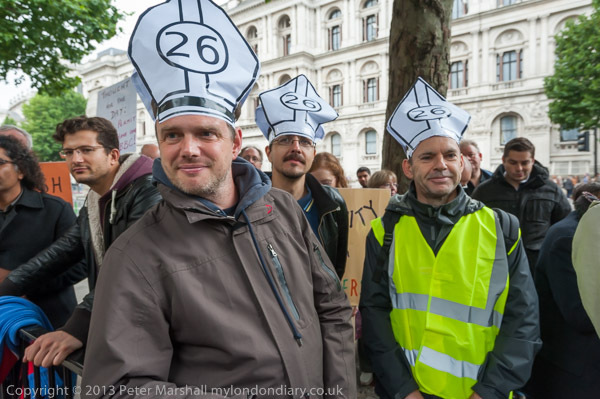 Many of those at the protest were wearing paper versions of a Bishop's mitre with the number 26 on the front, the number of Church of England Bishops in the House of Lords. Others had placards about indoctrination in some schools and the lack of secular speakers on Radio 4's 'Thought for the Day'. One of the speakers I heard made it clear that he was opposed to indoctrination in schools but also said it was important to say that not all church or religious schools were guilty of this, with many providing a good education that encouraged their pupils to think for themselves. I was pleased to hear this, as sometimes at such events speakers have adopted a blanket attitude against anything connected with religion. Some of the other things that concern the secular movement are religious discrimination against women and gays, abuse of children by the clergy, the teaching of creationism in schools, the anti-abortion lobby and misinformation about contraception and AIDs, religious male circumcision and female genital mutilation, false accusations about witchcraft, Sharia law, forced marriages and the right to die with dignity. These are all concerns that worry many religious people as well, and certainly some of them would only be supported by a minute proportion of believers. One of the speakers while I was taking pictures mentioned death treats by Muslims against ex-Muslims, and there are surely very few in any religion - even Muslims - who would support these. Many religious people too would welcome recent changes that were also mentioned allowing greater freedom of speech, and in particular the freedom to criticise - and make fun of religion, and are as shocked as any secular thinkers by such things as child abuse by clergy. Although I'm a supporter of secularism I also have respect for many religious people and their views, and some religious views of my own. Some secularists seem to want to have the kind of fundamentalist outlook that I deplore. 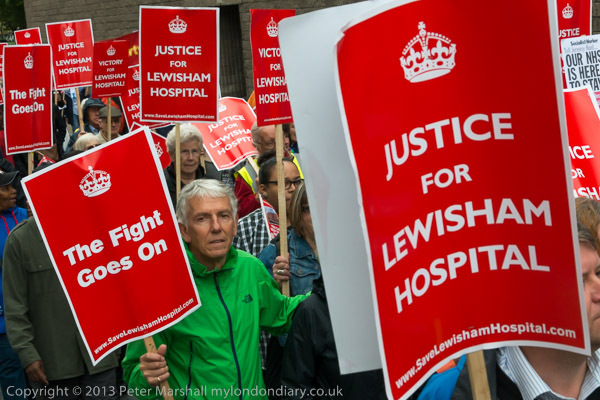 The Save Lewisham Hospital Campaign held a community march through Lewisham past the hospital to a free celebration in Ladywell Fields of their High Court victory which overturned the government closure plans. The government plans to close most of Lewisham Hospital led to massive protests in the area, where Lewisham is a highly successful and well run hospital serving a large area of South London. The closure was not a response to any failure by Lewisham and would have severely damaged the health service in the area. It's sole purpose was to allow the NHS to continue to make massive PFI repaymnents due from the building of other London hospitals through contracts that were badly negotiated when interest rates were high and have already delivered huge profits to the banks. Both Lewisham Council and the Save Lewisham Hospital campaign went seperately to the HIgh Court for Judicial Review of the decision by Health Secretary Jeremy Hunt, and both were successful. But rather than admit he got things wrong, Hunt is planning to appeal the decisions. The campaign is urging people to sign a petition asking him to accept the defeat gracefully and not waste any further time or taxpayers money over the appeal. It does seem unlikely that the appeal will succeed, as the judgement was fairly clearly against the government on several points. But the court decision has given new hope to other hospitals facing closure and some of them were represented in today's Victory Parade. Part of the government's plan, a merger between Lewisham and the Queen Elizabeth Hospital in Woolwich, is however going ahead, and should take place in October. Since the Woolwich hospital is saddled with a huge debt this merger will endanger the future of the new joint hospital. While the protests against the closure brought out many thousands on the streets, today's Victory Parade was a much smaller affair, with a little under five hundred people carrying placards and banners through the streets. A few more turned up for the celebration, but the dull and damp weather may have put many off. The parade was led by a council dustcart with large posters on it, and behind it the marchers include a couple of nurses in uniforms that they wore to take part in the Olympic opening ceremony, along with a small street band. As they march went past the hospital they and a few others crossed the road to stand in front of the old hospital building waving to marchers as the rest of the march passed them, rejoining the march on the end. In Ladywell Fields there was live music and some people danced to it, while others stood and listened. Just before I left there was a children's dance 'competition' with everyone taking part getting chocolate bars. 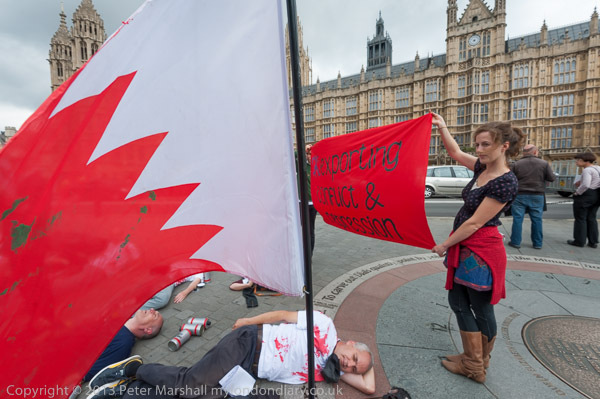 As MPs came to debate the role of United Kingdom Trade & Investment including its promotion of the arms trade, protesters against the DSEi arms fair now taking place in East London came to parliament and staged a protest with a 'die-in'. MPs were arriving to take part in a debate on the role of United Kingdom Trade & Investment (UKTI), including its controversial Defence & Security Organisation (DSO), the government’s arms sales promotion unit. It was taking place as the worlds largest arms fair, DSEi is being held in east London, and many of those taking part are involved in a series of protests taking place around this. The DSO extends official invitations to the DSEi arms fair to 67 countries, icnluding Algeria, Bahrain, Iraq, Oman, United Arab Emirates and Saudi Arabia, Libya, Afghanistan, Turkmenistan and Uzbekistan. Inevitably some of the arms sold at the fair will end up fuelling the civil war in Syria and other conflicts around the world, as well as repressing internal dissent in countries such as Bahrain. Bahraini protesters were among those present at today's protest. MP Jeremy Corbyn came to speak briefly on his way to speak in the Parliamentary debate. He praised the protesters for their protests today and for their continuing events to stop the DSEi arms fair. Stop the War held a protest at the US embassy on 9/11, the 40th anniversary of the US backed coup in Chile, against any military intervention in Syria. The US flag was at half mast for the anniversary of the twin towers attack. Protesters were still occupying the roundabout at the eastern gate of the DSEi arms fair in East London, with around a dozen sleeping there most nights, and more visiting during the day. 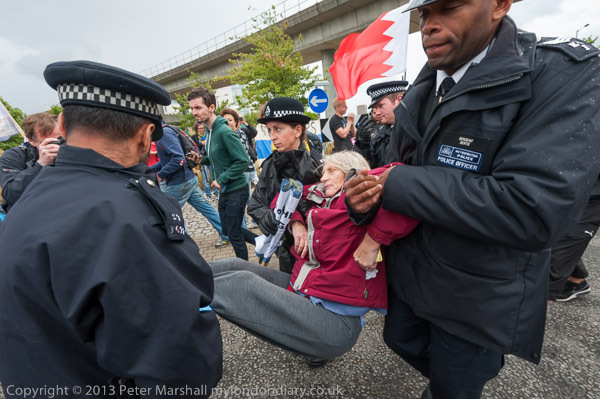 Some protesters had been arrested earlier in the day after blocking the entrance to the arms fair for a short time. While I was there the protesters were handing out leaflets to the few pedestrians who left by the eastern gate, and showing posters and banners to vehicles, including several coaches that were taking visitors from the ExCel centre. Peace activists launched a wreath on the dock opposite the London DSEi Arms Fair and held a short commemoration for those who will be killed by weapons sold there, and those already dead from those sold at previoua DSEi fairs. 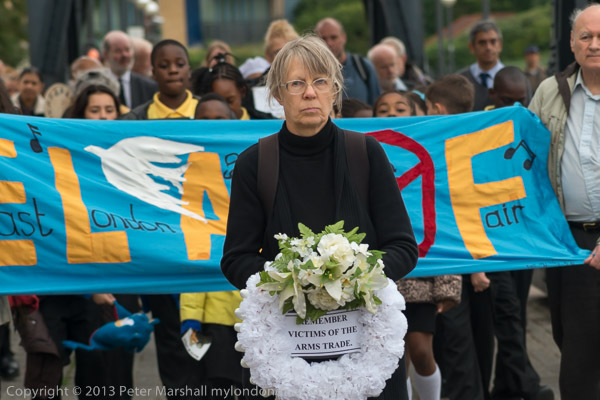 The protesters had walked around the Royal Victoria Dock to a site facing the arms fair in the ExCel centre led by a woman in black carrying the white wreath with the message 'Remember Victims of the Arms Trade' followed by the East London Against Arms Fair (ELAAF) banner with its dove of peace. This year they were joined by a class from the local primary school, many of whom took photographs on their tablets and interviewed some of those taking part. As well as locals from ELAAF, the protest was attended by two Buddhist monks and a group from activists who have been occupying the roundabout at the East gate of the Arms Fair at ExCel since Sunday. When the slow procession came close to the end of the path opposide the arms fair, they stopped and sang a song against the arms fair before the wreath was placed on the water in the dock. Then there was a two minute silence in memory of those killed by the arms from deals made at the previous fairs and those who will die from the weapons being sold at this DSEi fair. The event ended with another anti-war song, after which everyone dispersed. 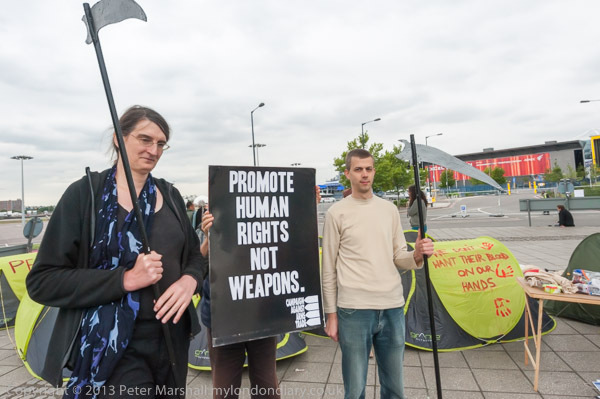 Several hundred protesters from the Stop the Arms Fair coalition occupied a roundabout at the East entrance of the ExCel Centre, blocking some early deliveries to the world's largest arms fair which starts there this Tuesday. The protest was one of around 15 events organised by the coalition, which includes around 25 groups, including the London Campaign Against the Arms Trade (CAAT), Disarm DSEi and East London Against Arms Fairs, and was also supported by a number of others including Occupy London and Quakers for Peace. There have been campaigns against the arms fair since it came to London by peace campaigners and others horrified by the sale of arms for killing and repression to clients from all over the world, including some of the most despotic regimes, cruellest dictators and warmongers. Although there are some restrictions on where British arms can be sold, in practice these fail to stop us supplying tyrants, and the sales by non-British companies from the fair are not even restricted by our own ineffectual regulations. Weapons banned by international conventions have been found on sale at previous fairs. Also present were some protesters from those who have suffered from weapons sold at previous DSEi shows, including Bahrainis. Around a hundred protesters were already at the meeting point of Prince Regent DLR Station when I arrived, despite there being no train service, and the protest set off a minute or two early, walking rapidly along a path to the roundabout. Tents were instantly erected on the hard surface of the roundabout under the DLR viaduct, and the protest began at the two gates there to ExCel and on the approach road. Within seconds the 'Bike not Bombs! critical mass of cyclists who had gathered earlier at Bank came up to the roundabout and began cycling round and round it. There were a few police around, but they appeared to have been taken by surprise and made no attempt to stop the protest. While this was hapenning, three activists had locked themselves together with arms in pipes and lay on the tarmac blocking onte of the gates to ExCel, while others had begun to protest in front of the other, and a group of four dancers had started to perform. The protest continued with a samba band playing and more police arriving, but apparently not knowing what to do. Raised voices were singing anti-war songs, stalls were being set up, incident tape with the message 'WARNING: ARMS-TRADE AT WORK THIS IS NOT OK' WAS BEING stretched along fences and around the DLR pillars and some people were busy writing messages on the tents or making posters. After an hour there were a series of speeches, beginning with the Green Party Leader Natalie Bennett, who was followed by several speakers from countries where arms sold at DSEi arms fairs had been used to repress political dissent, including Bahrain and Turkey. There were several showers, but none lasted long and the protest continued, with short stops every few minutes as the very noisy planes taking off from London City Airport flew over. Afterwords the protest continued with various events in different areas around the roundabout and the gates, including poetry performers and religious gatherings. There were art activities for children, and some adults painted more slogans on the tents, and there was a lot of chalking on the roadway and roundabout edges. Around 3pm a large group of police came across and split up to go round telling the various small groups of protesters they thought the road had been blocked for too long and asking them to move onto the actual roundabout. It was a very politely made request and quite a few people did so, but after a few minutes some decided to begin a die-in on the roadway, and soon there were around 50 bodies on the road. The police retreated to rethink, and people began to outline the bodies on the road in chalk, before a sudden very heavy shower cleared the road. Then a smaller group decided to stage a sit-down on the less wet strip of road under the DLR viaduct. A few minutes later the police returned in force and surrounded them. They said anyone who wanted to could get up and leave freely, and most did. A few who remained, who seemed mainly to be Christian pacifists, were then arrested and taken away, at first to a nearby grass area, and then to a police van. Police then cleared all remaining protesters from the road onto the roundabout. Many of the protesters had gone home and I decided to leave too, though the protest was continuing, and some of those present were hoping to stay all week. From the protest at the Excel centre I walked across Victoria Dock on the high-level bridge to Silvertown, taking a few pictures on my way, including a British frigate, HMS Sunderland with a helicopter on show which had come to DSEi early, and another visit to the Silvertown memorial. 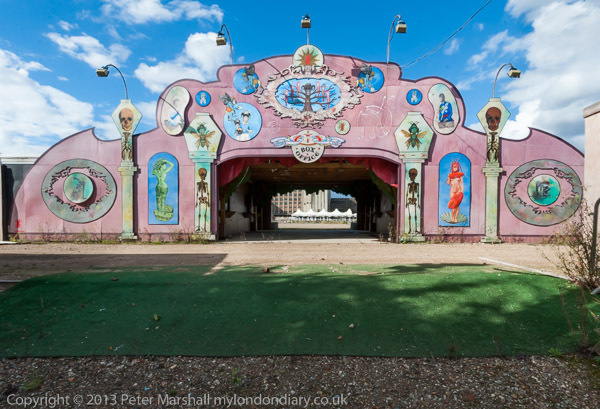 I wandered across to the very locked gate to the London Pleasure Gardens, which I didn't quite manage to get to in the few weeks they were open - I was due to photograph an event there the day following its closure. I made a couple of panoramas from the elevated platform of Pontoon Dock DLR station opposite, showing the Thames Barrier Park and the Barrier. Then I took advantage of a clean window on the DLR and some fine clouds to take some pictures of Barrier Point and the industrial areas between the railway and the Thames on the way back to Canning Town. 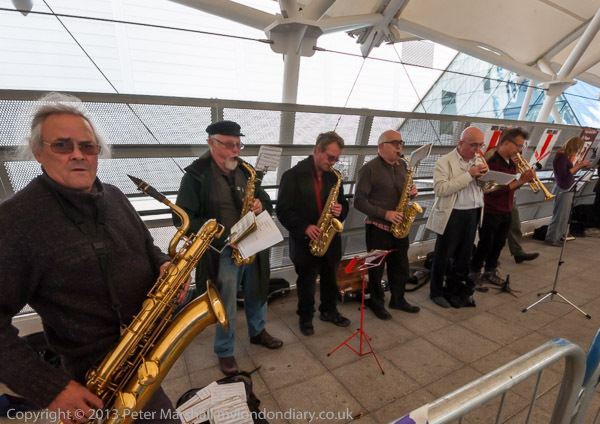 East London Against Arms Fairs (ELAAF) held a Musical Protest against next weeks DSEi arms fair at the ExCel centre in East London today, with a big band, singers and others handing out leaflets opposing the event. The DSEi arms fair, held every two years at the ExCel Centre in London Docklands attracts buyers from all over the world, including those from many countries with oppressive regimes. It's a showcase for the weapons they need to continue to oppress their populations and to wage war on their neighbouring states and others. Over a thousand companies will be selling their lethal products there next week, and the buyers will include human rights abusing regimes such as Algeria, Bahrain, Colombia, Saudi Arabia and Vietnam. 'Stop the Arms Fair' have called a week of action against the arms fair and at the factories of those companies that profit from killing. ELAAF have been opposing the fair since it came to ExCeL in 2001 and will continue to do so until it is cancelled. They hold regular protests at ExCel during other events as well as the arms fair to let "charities, professional bodies and respectable companies who do not know that they are supporting a venue that helps to trade weapons of death and oppression around the world." "The DSEi arms fair invites unscrupulous arms dealers from countries with no gun control. Advanced weapons are sold to countries at war with each other. Weapons, tanks and missiles are sold to regimes that oppress their own people or attack their neighbours. Delegates from countries that need aid for health services, education or agriculture are persuaded to incur debt to purchase weapons." "While the profits of this arms fair and ExCeL are exported to their owners in New York and Abu Dhabi, the shame of hosting the fair remains in London, and the slaughtered, bereaved and maimed victims are all over the world." The protest was held along tha path leading from Custom House station to the Excel centre, the route most visitors normally take to the centre. There were fewer than normal people using it today as the DLR which serves the station was not running, and was replaced by a rather slow replacement bus service. It's a rather cold and windy spot, although under cover, and I didn't stay long. Although most of the protesters welcomed me taking pictures, and quite a few knew me from other events or were old friends, I was shocked by an unnecessarily rude and negative response from a couple of others - I'd had enough of that earlier in the day from some of the EDL. Perhaps this kind of attitude explains why this was a fairly small protest against a major event. I think those tomorrow and later in the week will be rather larger. The EDL march to Tower Hamlets was opposed by thousands united as a community against fascism in Whitechapel. Only the overwhelming police presence prevented them from stopping the EDL reaching Aldgate. It's perhaps a shame I couldn't take Tommy Robinson, who I'd left speaking to around a thousand of the EDL close to Aldgate station with me as I walked further east through the various police lines, to Whitechapel, where the community of Tower Hamlets were united in opposing him and the EDL. It was a remarkable change in atmosphere from the feeling of hate and Islamophobia that filled the air with gestures and chanting from the EDL to the incredible unity and warmth of the several thousands largely from the local community who had come out to oppose them and make a statement based around love and shared experience of living in Tower Hamlets with people of different backgrounds and religion. It was a difference in feeling even the most hardened racist would have found difficult not to sense. But in Whitechapel, although there was a determination as in the 1930s and the battle of Cable St (I'd walked past where it happened earlier in the day) that 'They shall not pass', the overwhelming feeling I got from the several thousands around the area was one of a united community rather than of hate. But fortunately for the EDL, the police were there in strength to prevent to two groups meeting, with predictably disastrous results for the them, who would have been heavily outnumbered by the local youth. I'd left the EDL protest before Tommy Robinson was arrested for incitement, apparently for suggesting that people break some of the restrictions that police had imposed on the EDL march and rally. Although I had a few minor criticisms of the police they overall prevented any large outbreaks of public disorder. The EDL may be up in arms about the arrest of their leader, but should thank the police for protecting them from a severe beating. 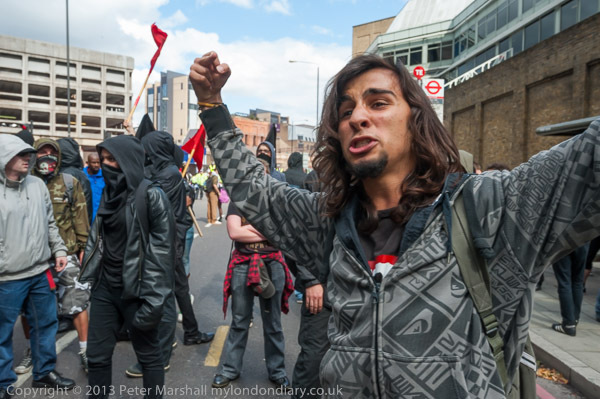 The EDL march to Tower Hamlets was opposed by a small group of anti-fascists near Tower Bridge. As the EDL march came across Tower Bridge towards Tower Hill, a red smoke bomb was thrown a couple of hundred yards ahead, and photographers rushed towards the scene, where a line of police vans blocked the bottom of Mansell St. There I walkedwithout being challenged past the vans and through a line of police to photograph anti-fascists who had evaded the police in Whitechapel to come to protest closer to the EDL march. These protesters were mainly young and felt very angrly about the EDL - racists and fascists - coming to march in their area. I left after a few minutes to try and rejoin the EDL march before it arrived opposite them, but had to walk around the block and through several lines of police along with a couple of other reporters to get back. I heard a lot of noise and saw the EDL shouting back at the anti-fascists, but the strong police presence kept the two groups around 50 yards apart and stopped me getting more pictures of the confrontation. Later i read the reports that police had kept the anti-fascists kettled for hours and then arrested many of them. Around a thousand EDL supporters marched from Bermondsey across Tower Bridge to a rally in Aldgate High St on the edge of Tower Hamlets. A few hundred yards down the road a large group of anti-racists opposed them but police kept the two well apart. There was a strong police presence as I walked towards the street where the EDL were meeting, with police standing on all sides around them and some mingling with the crowd of several hundred. They joked and the press, many posing for photographs and there was clearly a less confrontational attitude than at other EDL protests I've photographed, but there were still many expressions of hate, and then and later a number of Islamophobic chants - later as they marched towards Tower Bridge a very large group, perhaps the majority of those marching, was chanting "Allah, Allah, who the f**k is Allah". Around half an hour before the march was due to start, the police brought the protesters together close to a loudspeaker van, and put a line of police across the front of the street. Every few minutes the van clearly played the a statement about the conditions laid down for the event - the exact route to Aldgate High St, that they were not to try to proceed beyond Mansell St, that there was to be no alcohol on the march, that the rally was not to be longer than 30 minutes and they would then return by the same route to the start point, and that they should obey the orders of officers, that nobody would be allowed to leave or join the march en route and a few other stipulations. Earlier the police had handed out A4 sheets containing the same conditions to many of the protesters. 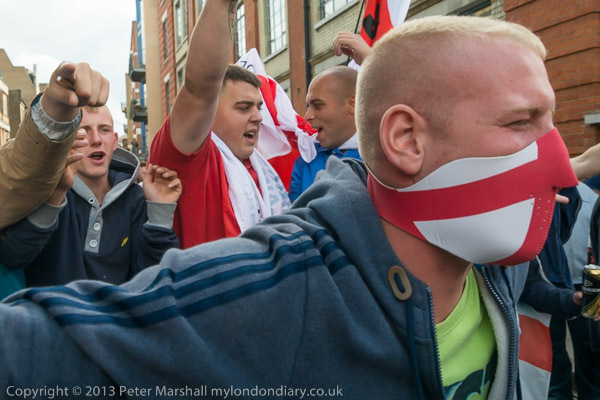 There was one small incident before the march started when an EDL supporter was injured, blood running down his face as he was led out of the crowd. Later I heard the an EDL steward allege that a bottle had been thrown across the road from the corner of Queen Elisabeth St and Tower Bridge Road, but I could find no-one who had seen this. A couple of protesters had arrived in pigs head masks, and police made them take them off and hand them over. Around ten minutes before the march was due to start, EDL leaders Tommy Robinson and Kevin Carroll arrived and were greeted warmly by many of those taking part. They held up the march for a few minutes for latecomers to arrive and then the march set off. The police had been reasonably helpful to photographers before the start of the march, though they had wasted a lot of effort trying to clear a space in front of the marchers, which protesters were still arriving through and photographers went back in to photograph. Some rather noisy police dogs walked with their handlers a hundred yards of so ahead of the protest, with a space behind them and then came the marchers with a couple of lines of police in front and others tightly spaces along the sides. The police tried to keep photographers away from the march at this point, and there were many contradictory orders as we went across Tower Bridge. It was difficult to get any good pictures. Basically the police were preventing us from doing our job, and it seemed they were doing so at the request of the EDL march stewards. I was a hundred yards or more ahead of the EDL we approached East Smithfield, I saw some red smoke coming on the ground in front of a row of police vans across the bottom of Mansell St and made my way there. 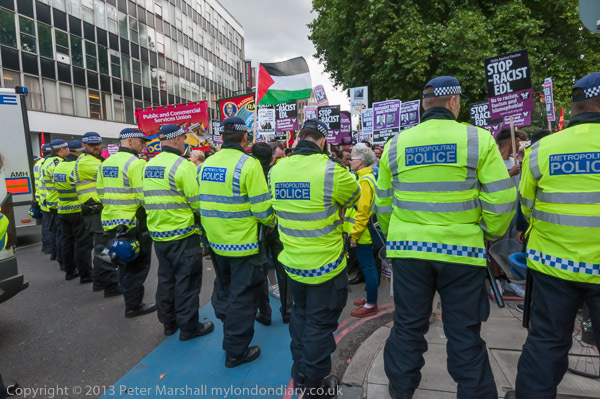 Police were kicking two smoke bombs, and behind the vans and a row of police were a smallish group of perhaps 50 anti-fascist protesters, mainly dressed in black, with red and black flags and a few with Unite Against Fascism placards. The EDL march stopped for a couple of minutes opposite them and the two sides traded insults with police between them keeping them well appart. From here the march to Aldgate High St was uneventful. Kevin Carroll waved to welcome the crowd who gathered around to listen to Tommy Robinson speak. I took a few pictures and moved away to photograph the considerably larger group of East Londoners who had gathered a few hundred yards down the road to oppose them, passing through half a dozen or so police lines to do so. Disablement activists who had been protesting at various ministries in the morning came together along with others whose coach had been delayed by traffic for a single afternoon protest outside the Dept of Work and Pensions, with a very capable list of speakers including Sean McGovern, co-chair of the TUC's disabled workers' committee, John McArdle of the Black Triangle Campaign (named after the symbol the Nazi's forced those they considered "asocial" or "workshy" to wear) and Richard Reiser, co ordinator for UK Disability History Month, along with several from DPAC itself. 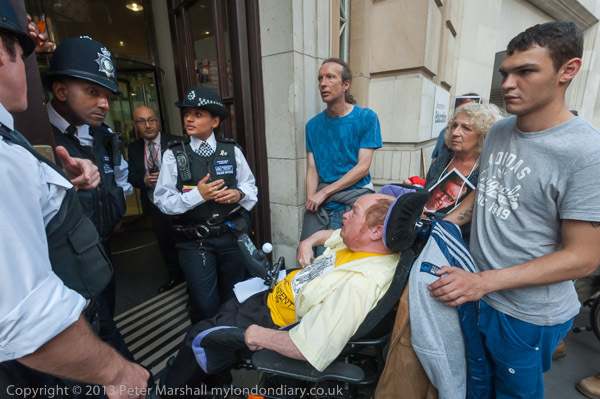 The pavement and part of the street outside Caxton House was crowded with over a hundred protesters along with photographers and videographers, and around 35 assorted wheelchairs and mobility vehicles. There was a performance by Heydon Prowse (apparently of a television programme 'The Revolution Will Be Televised', about the only way any slightest hint of real political protest gets broadcast by the BBC), dressed in a white suit and coming with a three-piece gospel choir in a rather pale imitation of the Rev Billy. Mildly amusing, his performance about the ATOS miracles lacked the professionalism, fire and conviction of the real thing. "With around 1 in 5 of the population being disabled and many more affected by disability as family, friends and carers or simply as citizens who care about social justice, policy and pledges on disability will be a key concern of many voters as we approach the next election." The UK Disabled People’s manifesto was produced by disabled people and their organisations and sets out the key principles, demands and commitments that are important to Deaf and disabled people. I stayed with the protest at the DWP, where Andy Greene from DPAC opened the large bag I had notice he had been carrying around all day. He reminded us that Ian Duncan Smith had his problems too (earlier McArdle had described him less sympathetically as "the psychopath that is the minister in this office".) One of his problems had been over housing, but had been solved when his daddy-in-law had given him the mansion where DPAC activists had visited him for a protest on his very nice lawn, and another was apparently with some very personal items. Back in 2003, one of his senior aides gave evidence to a House of Commons Committee that he had claimed expenses from the taxpayer for - among other items - his underwear. So here were lots of pants for IDS, and we were invited to personalise them with a message saying what we thought of his policies, after which they could be pegged up on a washing line between the lamp posts outside the ministry. None of the comments were positive but there were just a few that were fit to photograph and print. 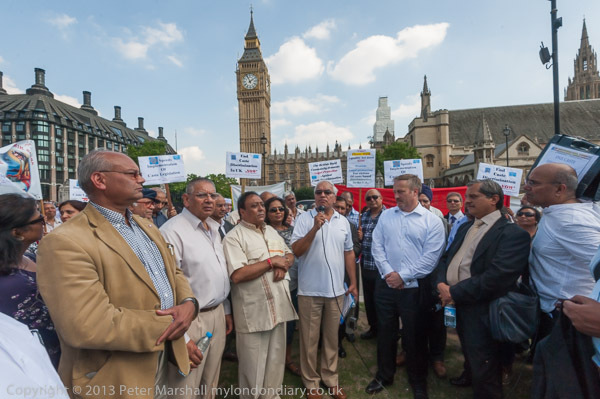 UK Dalits protested on Parliament Square at the failure of the government to outlaw caste discrimination in the UK, instead kicking the issue into the long grass of 'consultations' and another report which can add little to that published in 2010. In April this year it looked as if the UK government had a last realised the problem of caste discrimination in the UK and were prepared to do something about it. After the House of Lords had twice voted for the UK's estimated 2-400,000 Dalits (formerly known as untouchables) to be granted protection under the UK's equality laws the government tabled a motion under which the Secretary of State had to bring forward regulations to include caste as an aspect of Race (under Section 9(5) of the Equality Act) within two months of the Enterprise Bill being enacted. However, Equalities minister Helen Grant decided to deliberately delay the introduction of the law, making clear she thought it was not necessary, and announced a two year delay for 'consultation' over the measure, delaying its introduction until after the next election and effectively "kicking it into the long grass." Not only that but the proposed consultation seems to have been designed to placate Hindu groups representing higher castes (what they call "the majority British Hindu community") in the Alliance of Hindu Organisations, writing them a widely quoted letter in which she said: "I made no secret at our meeting – and nor do I now – of my disappointment that it has been necessary for the government to concede to making an order to include caste as an element of race in the Equality Act 2010 following the further defeat in the house of Lords …"
The Dept of Culture, Media and Sport and the Alliance both say there is a need for further research into caste-based discrimination in this country. In fact a report was commissioned from the National Institute of Economic and Social Research several years ago and published on 15 December 2010 by the Government Equalities Office which concluded that there was evidence of caste-based discrimination in work and the provision of services, in bullying in education, in voluntary work, worship, religion and harassment in public places, concluding "The consequences of these could be severe for the victims." More than a hundred people attended the protest in Parliament Square, facing the House of Commons, lining the side of the road with banners from various Dalit religious groups including the 'Federation of Ambedkrites and Buddhists in the UK', several Ravidass temples and the Indian Workers Association. A meeting and placards called for the immediate enactment of the regulations to include caste discrimination in the Equality Act. Caste Discrimination was outlawed in the Indian Constitution when it was set up in 1950, and laws in 1955 made enforcement mandatory. For Sikhs, Guru Gobind Singh abolished all caste inequality with the formation of the Khalsa on 13 April, 1699, although not all Sikhs live up to this ideal. Quite why the UK Government should want to lag so far behind the country from which this caste system originates is difficult to grasp. I joined the DPAC (Disabled People Against Cuts) 'Freedom Drive', which was the culmination of week of 'Reclaiming our Futures' actions at the Dept of Health in Whitehall, where there were eventually around 50 disablement activists holding a protest "to defend our NHS and demand our right to levels of social care support enabling choice, control, dignity and independence." There were banners, posters, placards, speeches and songs, including 'Citizen Smart' (Alan Smart) and Adeola Johnson, who sang her 'General Strike', calling on everyone to join in on the chorus - and of course to take action against the attacks by the coalition government on the poor and disabled. I left early to go to the Department of Energy and Climate Change and join those "angry about the numbers of disabled people living in fuel poverty while the energy companies rake in ever growing profits" to hear more speeches and songs. There were people holding a banner across the door which appeared to be blocked. Again I left before the end, catching a bus to the next of the four initial venues. There was rather more anger on display at the Dept of Education, with a group crowding around the single doorway shouting and arguing with a man refusing them entry. They kept asking for either someone from the department to come out and discuss their protest against government attacks on inclusive education and a return to segregation or for a delegation to be allowed in to deliver their manifesto. People were still being allowed to enter and leave the building by the protesters, though there were some minor hold-ups as the building has only one fairly narrow door. After I left three people were allowed to take the manifesto in, and were told that they might be allowed back to discuss it later in the week. Most of those taking part in the protests were disabled - DPAC was formed by disabled to give a voice to disabled people who are so often patronised and marginalised, despite many being highly intelligent and articulate and obviously being able to speak from experience. As users of services they know better than the highly paid consultants that governments seem to prefer to rely on to give the answers they want. 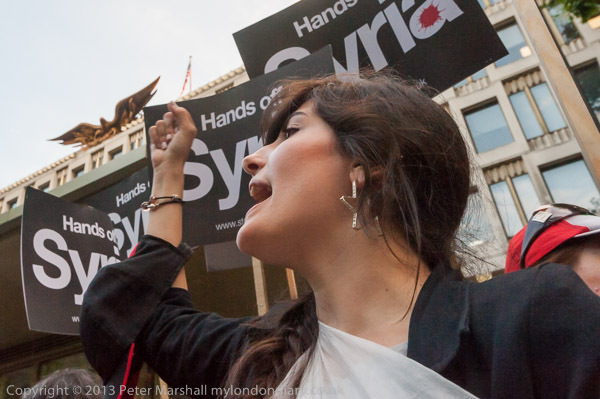 Several hundred people, including many Syrians living in the UK, came to the US Embassy this evening for a protest rally to keep up the pressure on President Obama not to bomb Syria. The event ended with a lengthy protest by pro-Assad Syrians. The protest called by Stop the War lasted around an hour, with a number of speeches by speakers from various groups. There was some angry dissent from pro-regime Syrians when a speaker representing Syrian Kurds talked about the discrimination they suffered in Syria, claiming that the people of Syria had been a united people before the current civil war and that there was no such discrimination in the country. It was a claim that is clearly ridiculous, flying in the face of the facts. Kurds make up around 9% of the Syrian population and according to reports by Amnesty International, Human Rights Watch and other international organisations are subject to discriminatory policies against their language and dress; many of them have called for political autonomy or independence for the areas they call 'Western Kurdistan', and in 2006 formed the Kurdistan National Assembly of Syria. More than 300,000 Syrian Kurds are stateless, either because the government has stripped them of their nationality or because they were registered as foreigners or were not allowed to take part in the census. They cannot vote, stand for public office, gain school certificates or university degrees, or travel outside their own provinces. The same Syrians also protested vociferously that the regime had not used chemical weapons in Syria, blaming others for their use. It is perhaps too early to make any such definite claims while we await the UN report, and fuller details of the US intelligence reports are available - perhaps one day on Wikileaks! After the end of the official Stop the War protest the pro-regime Syrians took over with a noisy protest against US intervention, with much chanting of anti-intervention slogans and waving of the regime Syrian flags. 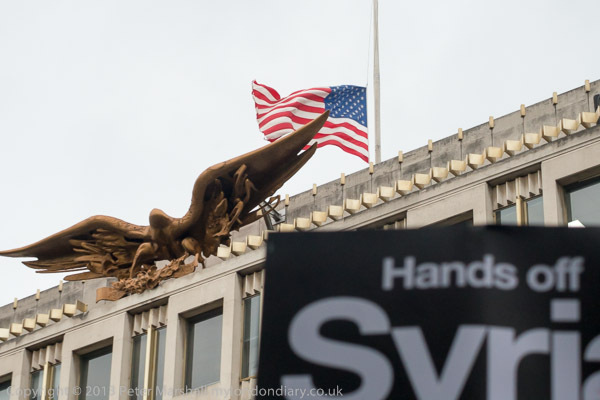 As well as the 'Hands off Syria' placards, there was one with a larger than life picture of Assad, as well as a Syrian flag with his image on it. During the protest, anti-war campaigner Maria Gallastegui announced that a peace camp had been set up by the embassy and would continue there 24/7 at least until the result of the debate in the US. There is another protest camp already in front of the embassy over the attacks on Camp Ashraf in Iraq on 1 September, allegedly by Iraqi security forces or the Mukhtar Army, a Shi’a militia, in which at least 47 members of the Iranian Mujahideen-e Khalq who were exiled there were killed. Amnesty International has called on the Iraqi authorities to conduct a thorough and impartial investigation. 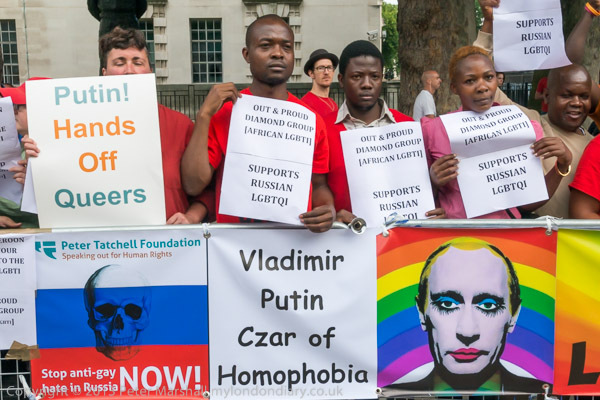 A protest at Downing St in a world-wide day of action against Russian homophobia 2 days before the G20 summit in St Petersburg hosted by Putin, called on Cameron to press him to repeal the Russian anti-gay law and prosecute violent homophobes. Several hundred turned up for the protest, many wearing red as suggested by the even organisers, and some in more colourful costumes. One man was dressed as a Red Army officer and several came in drag. Among the more vocal were a large African LGBT contingent, and Peter Tatchell posed for photographs in front of them. • David Cameron: What are you doing about the anti-gay law in Russia? We want answers. Tell Putin to drop the law. 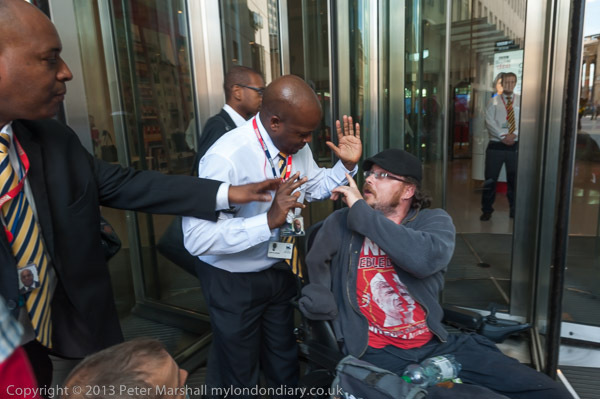 Disablement protesters, some in wheelchairs, protested at Broadcasting House in London at the BBC's failure to report truthfully the effects of government cuts, particularly on the disabled, blocking the main BBC entrance. The protest was organised by Disabled People Against the Cuts (DPAC) and the Scottish Black Triangle anti-defamation campaign in defence of disability rights. Around 15 people, including four in wheelchairs, met at a nearby cafe to discuss final plans before making their way with legal observers and a few photographers unnoticed to the main entrance of the BBC building. There they quickly spread out across the row of doors with their banners. BBC security staff then locked all but one of the end doors, keeping a passage clear through that. The protest began with almost all of those taking part speaking out in turn about the failure of the BBC to report the real hardship caused by ATOS assessments and the withdrawal of benefits, benefit cuts and caps and the bedroom tax. They were all fed up with the BBC repeating the lies and half-truths of government and asked why the real problems and numerous deaths from the austerity programme and the protests over these were not being properly reported. The situation is critical for many poor and disabled people, with over 500,000 having to resort to food banks set up by churches and charities to fend off starvation. The protesters chanted 'BBC, Tell the Truth' and requested someone from the BBC to come and discuss the issue with them - but no one would. They made clear they were not asking for special treatment for the disabled, but for full, accurate and impartial reporting - something the BBC once had a reputation for, but sadly no more. Near the start of the hour-long protest, activist comedian Mark Thomas by chance walked out of the BBC, and came to greet the protesters, some of whom he had met when he gave a 'mass miracle' performance outside Atos's Edinburgh office as part of the Fringe Festival. He was persuaded to speak briefly and gave his support to the protest, praising the protesters for coming to make their views known to the BBC. Soon after this, two of the protesters, one in a wheelchair, moved in front of the only open door, blocking this by D-locking themselves together in front of it, closing the entire entrance for the remainder of the protest. At this point the BBC security guards who had earlier made a half-hearted attempt to persuade the protester to clear the entrance made another attempt. Again they were repulsed when protesters made clear to them that they were not going to move and would bring charges of assault if the security tried to move them physically. At this point BBC Security called the police, and around 25 minutes later two police cars arrived. The officers spent some time talking with BBC security, and then came to talk to the protesters, who informed them that they would be leaving peacefully in around five minutes at the end of an hour's protest. Although the BBC did not send anyone to talk seriously with the protesters, a few minutes before the protest ended one of their cameramen arrived, having been asked if he would film the protest. I joked with him he might try and sell the footage to Sky or some other broadcaster who were rather more likely to use it. All pictures on this section of the site are Copyright © Peter Marshall 2013; to buy prints or for permission to reproduce pictures or to comment on this site, or for any other questions, contact me. All pictures Copyright © Peter Marshall 2013, all rights reserved.